My partner and I had a lovely time. 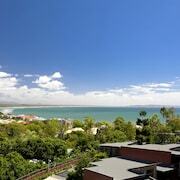 The accommodation was ideally located right next to the beach with cafes, restaurants and shops on the other side. The spa was an awesome bonus! We will definitely be going back. If humans were meant to stay in one place, we'd have roots instead of feet — so make like a tree and leave to Hastings Street! 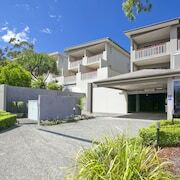 0.7 kilometres from central Noosa Heads, you'll find a hotel to suit your style, whether you're keen to splash some cash or keep things low-key. There is no better place to chill out than at Ed Webb Park. 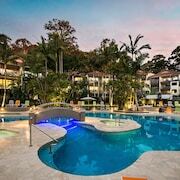 The Fairshore Noosa and Netanya Noosa are some of the top places to bunk down for a few nights close by. On a crisp, blue day, Noosa National Park is a wonderful space to take pleasure in what nature has to offer. Need a place to tuck in close to here? 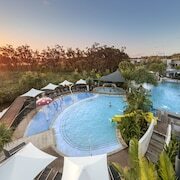 The RACV Noosa Resort and The Rise Noosa are favourites with many visitors. You definitely don't need soft bathrobes, an enticing room service menu and luxurious cotton sheets all the time (that said, you are on holiday, right?). 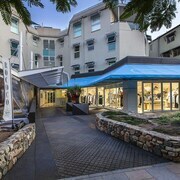 The deluxe options here are the Saks on Hastings and Mantra French Quarter Noosa. If you feel like sitting down with a strong coffee, Aromas Noosa is just a stone's throw away. Why not spoil yourself with a couple of sweet treats while you're at it? After all, holidays are for indulging, right? Stressing out cos you can't find the ideal place to catch some Zs in Hastings Street? 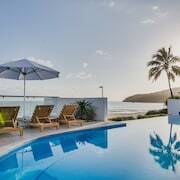 Then why not take a look at our Peregian Beach hotels guide? Peregian Beach can be found 11 kilometres away from Hastings Street. Sure, we all love take-out food apps and streaming sites, but sometimes you've got to get out of the house! Experience something new on an awesome adventure with a little guidance from lastminute.com.au.